Healthy eating before the wedding - help with wedding weight loss the week before the wedding! It's time to plan your cocktail hour! Cocktail hour is a wonderful time for guests to mingle and relax before the reception, and it gives you and your significant other some time to connect and have pictures taken. If you're stuck on which drinks to serve during this special time, we've got some inspiration for you! These cocktails are wonderful for your spring & summer affairs, or even for a get together with your bridal party. Below you'll find wonderfully tasty cocktails (& mocktails!) sure to delight. This cocktail is perfect for those who love the sweet & simple things. This drink is made with frozen fruit and rose wine, meaning that it's naturally sweetened by the fruit (and the sugar in the wine!). We love the idea ox mixing lavender and lemon to not only create a lovely, aromatic mojito, but a light & health conscious one at that! This recipe relies on pulling from lavender leaves and lemon juice, which provides a tangy, flavorful drink without a bunch of added sugars. Elderflower is receiving some well-deserved love in the news with the arrival of that beautiful elderflower lemon cake shared by Prince Harry and Meghan Markle at their wedding. The combination of the naturally sweet elderflower with the tangy bite of citrus make for a very refreshing cocktail. *Want to make it non-alcoholic? Simply swap out the elderflower liqueur for elderflower presse! This pair of mocktails is inspired by spring and made with protein water as one of the primary ingredients, so this drink is perfect for those who like to make sure they're getting an adequate amount of protein on the daily. For those who prefer a tart and somewhat spicy kick to their drink, you'll delight in this summer-friendly cocktail alternative. Reap the detoxifying benefits of kombucha and lemon with this twist on a classic fizz. With 0 added refined sugar and a natural sweetening component, this mocktail is a wonderful vegan/vegetarian option for all to enjoy. It's light, not too sweet, and provides a complex flavor combination that delivers a crisp and delightful sip. How to stop blowing your healthy eating on the weekend & starting all over again on Mondays! How to stop overeating for good! No more boredom, stress, or emotional eating. Lunch time can be boring eating the same thing over & over - but here are some fancier ways to spice things up! 1 Week Meal Plan to Get Ready for Engagement Pics! 1 week to go for your engagement pics? 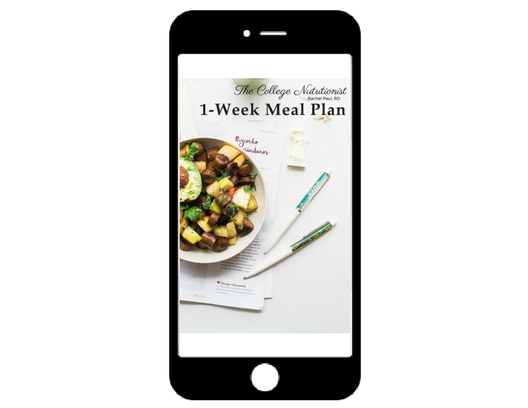 Here’s a healthy, simple, and filling 1-week meal plan!